Amanda wrote a great post last week on advanced bidding strategies. I wanted to follow up with an answer to a common client question about billing. Clients ask all the time, why should they bid on their own brand keywords when they rank highly in the organic results for their brand keywords? Isn’t this wasting money for traffic that would be had organically? Here are five reasons why brand PPC is NOT a waste. 1. Searchers eyes gravitate to the ad section of the SERP’s where competitors can show. Not surprisingly, Google puts ads where user’s eyes gravitate to on the SERP’s and your competitors CAN show ads there. It doesn’t help a company as much to rank highly in the organic listings for its own brand terms if a competitor’s ad is showing above the organic listing on the SERP. The image below is a heat map. 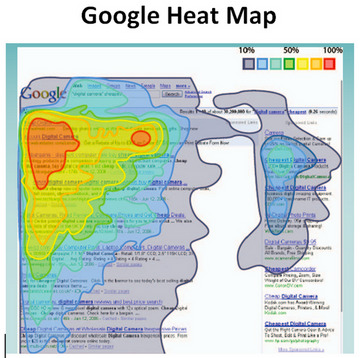 Heat maps track where people’s eyes go on the SERP’s. The hotter colors are where the most eyes gravitate to. Google is smart and wants revenue for itself. Advertisers can bid on competitor trademarks as long as they don’t use the competitor trademark in the ad copy itself. Here, you can see Ameriprise capturing traffic from searchers familiar with the GEICO brand. 2. PPC traffic often converts at a higher rate than SEO traffic due to PPC landing pages. In the online space, most companies make money by getting website visitors to buy something, or by having website visitors take an action that will lead them to buy something later. Landing pages are optimized for whatever that conversion action is. Website pages often cannot be so tailored for conversion because they need to include more navigation, content, and other features that are essential to a good website experience, but which can reduce conversions. For example, below are the conversion rates for many clients where we have access to SEO data as well. PPC conversion rate is at least 59% higher, sometimes almost 4x higher, than the organic conversion rate. Even if brand traffic could be had for free via the SEO results, it can be a better for ROI to send visitors to the website via a PPC landing page because of the higher conversion rate. 3. Brand PPC is often much cheaper than it’s perceived to be because brand CPC’s are often much lower than non-brand CPC’s. If someone searches for brand X, only competitors bidding on brand X will show. This is usually less than for a generic term like ‘insurance’. See here how much more competition there is for ‘auto insurance’ than for ‘GEICO’ (2 ads vs. 11). With brand traffic, which usually has less advertisers in the auction (less demand), prices (brand CPC’s) are usually lower. 4. Organic and PPC combined can generate synergies. AdWords recently created a report called ‘paid and organic‘ with SEO data from Google Webmaster Tools and PPC data. We saw a higher CTR for both SEO and paid listing when a paid listing was present. CTR increased by over 4x on the SEO listing (from 6.46% to 29.56%) when a paid ad was also to the SERP’s. Data can vary by client, but SEER has data showing that SEO brand clicks increase when ads are also on the SERPs. There are somewhat common situations that will make PPC desirable in some industries. Let’s say your business or client has negative press about them. This may not be due to anything you did, or be anything you can control. It may be likely to continue for forever because your business or client is in an unpopular industry. For example, banks and pharma firms can rightfully argue that they provide critical services for the well-being of society. However, many people hate these two industries and will keep hating them no matter what banks and pharma firms do for society, such as facilitating economic growth or curing illnesses. Other examples of industries which are perpetually unpopular but compose a large proportion of the economy (and thus a large proportion of our businesses and clients) can certainly be found depending on your point of view. Though we may disagree on what industries are ‘unpopular’, there will usually be at least some negative website activity about firms in unpopular industries which the search engines will index and show organically. A PPC ad can push these negative organic listings down the SERP’s so less people see it. In addition, ads give you more control over the message searchers see. Your ad is determined by you, whereas the organic listing text that’s shown is determined by the search engines. If your account has low quality scores, running a brand campaign which will likely have an excellent CTR and quality score can help account quality score. Affiliate marketers can siphon off brand activity in certain industries (insurance, utilities and telecom) so running your own PPC may be necessary. What do you think about running brand PPC? What have you seen from the very new ‘paid and organic’ report in AdWords? Does Google Data Studio Sample Google Analytics Data?